SACRAMENTO, Calif. (CN) – Just five days after water cascaded over Lake Oroville’s untested emergency spillway and sent 190,000 residents scrambling downstream, officials said Thursday they have decreased reservoir releases ahead of another round of storms in order to aid maintenance efforts. Citing progress made in dropping lake levels more than 32 feet since mandatory evacuations were ordered Sunday, officials are now reducing water releases to clear debris that has temporarily shut down the dam’s power plant. Dam operators are trying to get the hydroelectric plant which sits at the base of Oroville Dam, the nation’s tallest, back online before wet weather returns to Northern California over the weekend. The Hyatt power plant is capable of pumping 14,000 cubic feet per second out of the lake, but was shut down recently because of debris that his piled up near the power plant and spillway. The California Department of Water Resources says more than 277 personnel are assisting in repairing the dams’ damaged spillways and working to remove debris that piled up during the last storm. “Barges and cranes have been mobilized to remove debris and sediment from the diversion pool. These efforts are designed to restore the normal flow of water into the diversion pool and through the Hyatt power plant,” the department said in a statement. Since Sunday, dam operators had been releasing 100,000 cubic-feet per second from the jeopardized main spillway, but that number had dropped to 80,000 cfs by Thursday afternoon. Crews have been able to take advantage of a brief stretch of dry weather to begin patching up the spillway as well as significantly drop lake levels. 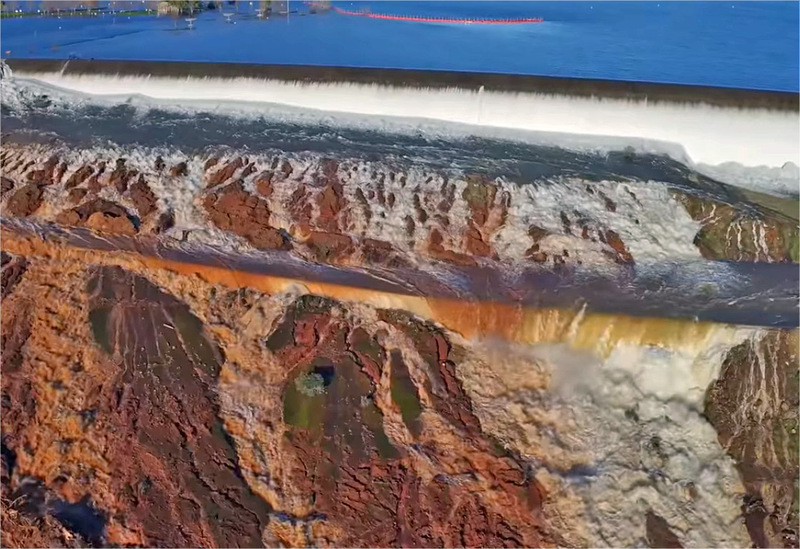 Problems with the 48-year-old dam were revealed on Feb. 7, after heightened discharges punctured a 300-foot-long hole in the main spillway. The erosion damage has been pegged at more than $100 million and President Donald Trump has since ordered disaster aid to help with repair efforts. After five dry years, drought-riddled California has experienced a constant deluge of wild weather since December. While the snow and rain has greatly improved California’s short-term drought situation, it has caused statewide flooding and strained the complex but aging flood-prevention infrastructure. The constant stream of water pouring from Lake Oroville into the Feather River has pressured downstream levees, particularly near the confluence of the Feather and Sacramento rivers. Construction crews performed emergency levee stabilization projects Thursday in preparation for the continued discharges from Oroville Dam. Last week Gov. Jerry Brown declared states of emergency in 49 of California’s 58 counties because of storm damage. Despite ongoing spillway repair efforts and another round of storms forecasted to strike Northern California beginning Friday, officials have lifted mandatory evacuations and let residents back into the downstream communities of Oroville and Marysville. They are confident they can continue dropping water levels through the weekend’s storms, which are expected to bring several inches of rain to the Lake Oroville watershed. National Oceanic Atmospheric Administration meteorologist Tom Di Liberto says the lake, which can hold more than 3 million acre-feet of water, has withstood higher inflows in past years. He said the amount of water entering Lake Oroville last week was the highest in roughly 20 years, but still well below levels recorded in 1997. This time around, however, the dam’s issues appear to be caused by infrastructure failure and climate change. “Events like this are a reminder that in a warming world, in which heavy downpours are expected to increase as greenhouse gases continue to rise, having resilient infrastructure will become even more important,” Di Liberto said in his latest NOAA blog entry.